A number of TDs stopped outside the Dáil to talk to the group of women about the complications they suffered after their procedures. THE MINISTER FOR Health has cancelled a meeting he was due to have with women who suffered complications after vaginal mesh surgeries. Vaginal mesh devices are used in surgeries to treat stress urinary incontinence and pelvic prolapse, conditions women can suffer after natural childbirth. There have been thousands of reports internationally of painful complications from women who have undergone these procedures. This includes a number of Irish women, some of whom have spoken to TheJournal.ie in the last year about their recurrent urinary infections and pain after the operations. Solicitor Melanie Power, who set up the Mesh Survivors Ireland and who is representing a number of impacted women in their legal actions against the State, was due to meet today with Simon Harris and Chief Medical Officer Tony Holohan. She had arranged to bring a small group of women with her so that their experiences could be taken into consideration in the CMO’s report. “Unfortunately, due to the Cervical Check issues Minister Harris and the Chief Medical Officer had other engagements and this meant our appointment had to be cancelled,” she said today at a protest by the group outside Leinster House. 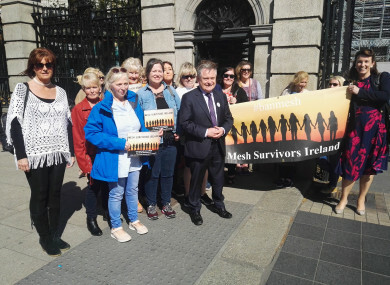 We have been given a rescheduled date now for the 6th of June and hopefully we will be able to express to them our concerns and the opinions of the ladies of Mesh Survivors Ireland and the deep pain they are suffering as a result of this device. “They are very much feeling abandoned by the healthcare system here and they want a retrospective audit to be carried out on the women implanted so we can speak from a position of knowledge as to what are the actual real risks and complications with this device,” Power said. Media coverage of these stories promoted Health Minister Simon Harris last year to order a report into the use of vaginal mesh devices in Ireland by the CMO. Now the women who are impacted by complications are worried about how long this review may take. “We’ve been waiting a long time to have this meeting. With regards to the CMO’s report, it was requested in November, we have no idea as to when it will be completed so that is something I’d be very keen to discuss with the CMO, particularly who he has spoken to because as yet he hasn’t contacted any of the people who are suffering as a result of this device,” Power said. Power said since the story broke in Ireland, she has been contacted by many women who had silently accepted their symptoms, until they read about other women who spoke to the media. “We have over 300 members in the [Facebook] group at the moment and that really isn’t a reflection of the numbers that have contacted me because a lot of the people are actually in the older age bracket and aren’t on social media,” she said. The Department of Health said the meeting was cancelled “owing to urgent other work commitments and has been rescheduled for early June”. Email “Health Minister cancels meeting with women who suffered vaginal mesh complications”. Feedback on “Health Minister cancels meeting with women who suffered vaginal mesh complications”.